Hailing from the river town of Stevens Point, Wisconsin, HHG plays something like progressive high-energy Old-Time folk music. With strong roots in old-time and bluegrass, the band has formed it’s own unique style born from the diverse musical backgrounds and interests of the five friends who make up the band. All born and raised in the great state of Wisconsin, Horseshoes and Hand Grenades began playing music and their earliest shows in the spring of 2009. 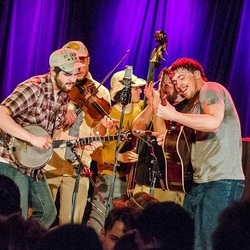 Since then, the band has shared the stage with the Infamous Stringdusters, Yonder Mountain String Band, Charlie Parr, Pert Near Sandstone, Art Stevenson and Highwater,.357 String Band, The Big Wu, and many more. Being mostly inspired by rivers, valleys, good friends, and good drink, this five piece is as sturdy as any midwest riverbed and will make your toes tape from sundown to sunrise.